GREEN BAY — The bikes were gone, the bleachers were half full, and for the last practice of training camp, the message was unmistakable: Summer is over. One preseason game remains to be played, however, and young reserves were getting the bulk of the work on Tuesday. Obviously, reserves will dominate the playing time Thursday night against the visiting New Orleans Saints. Scott Tolzien took the first few snaps with the offense likely to start the game on Thursday, but rookie quarterback Brett Hundley got the majority of the snaps in a team drill, giving the impression he’ll be the quarterback of record for the second consecutive preseason game. Meanwhile, wide receiver Jared Abbrederis returned to practice for the first time since sustaining a concussion in the first practice of training camp. He laid out in an attempt to catch a deep pass, and then trotted back to take the next snap and run a deep route on the other side of the field. 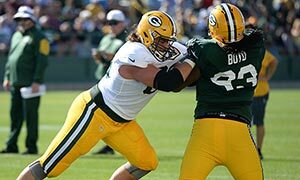 In especially good news, left tackle David Bakhtiari was back to practice after having been sidelined since the New England game by a knee injury.